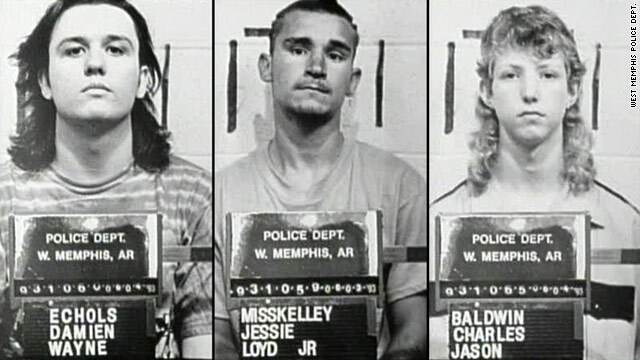 How can West Memphis 3 walk free? Three men convicted of killing three West Memphis, Arkansas, boys in 1993 were freed following a court hearing Friday. The men - Damien Echols, Jessie Misskelley Jr. and Jason Baldwin attended the hearing in Jonesboro, Arkansas. Echols had been sentenced to death, and Misskelley and Baldwin were given life sentences in the May 1993 slayings of Steven Branch and fellow second-graders Michael Moore and Christopher Byers. The boys' bodies were mutilated and left in a ditch, hogtied with their own shoelaces. So how exactly were the convicted men able to go free? New DNA evidence failed to link the men to the crime, and the state Supreme Court ruled in November that all three could present new evidence to the trial court in an effort to clear them. A decision was pending on whether the three would get a true trial. In essence, the deal made today negates the need for that. The three struck a deal with the prosecution by entering what is known as an Alford plea, which means they didn't admit to any actual criminal act, but they did acknowledge the prosecution probably has enough evidence that it would lead to their conviction. Under the deal reached Friday Echols and Baldwin entered what is known an Alford plea on three counts of first degree murder. Misskelley entered similar pleas to one count of first degree murder and two counts of second degree murder. Craighead County Circuit Judge David Laser sentenced the three to the 18 years already served and imposed a 10-year suspended sentence - meaning they could be returned to jail if they violate the law. "In a nutshell, you are pleading guilty not because you admit that you did something wrong but because you are concerned the state has enough evidence to prove you guilty," attorney B.J. Bernstein said. "This is a common thing in tough cases, where a defendant is just adamant; I didn’t do it, I didn’t do it, I didn’t do it. They won't confess to it, but the evidence is so strong they are going to lose." The highly technical legal maneuver also allows the three to be freed and be considered innocent. Although an Alford plea is treated as a guilty plea for sentencing, it cannot be held against the three men in any subsequent criminal prosecution or civil proceeding. The Alford plea stems from a Supreme Court case that looked at whether you could negotiate a plea deal when someone says they are not guilty. Typically, when you plead guilty, a judge asks you if you are in fact guilty of the crime you have pleaded to. The concern in the Alford case was whether people would plead guilty only to crimes they maintained they were innocent of because they were coerced. But the court ruled that defendants concerned about what would happen during a trial can in fact plead guilty while saying they didn't commit the crime. "The thing about Alford is, it’s a tool to end the case," said Bernstein, who has been both a prosecutor and defense attorney. "Because they are pleading guilty, from the prosecutor's view, everything a guilty plea means, is possible. But they haven’t lost anything. They are getting that guilty, versus some other resolution ... like offering a lesser charge." Bernstein said that even if the three men are freed, they will still have the word "guilty" and its implications attached to them when it comes to things like termination of rights and trying to apply for a job. But overall, the goal of a deal like this is to get resolution in a tough case. Because the men were convicted in 1993 and new evidence has been introduced, Bernstein said, the length of time between the cases could prove difficult for prosecutors. It's a matter of time and money to pursue the case as well. Although an Alford plea is used in difficult cases, some people don't view it favorably all the time depending on the case itself. "Otherwise, you have a lot of people saying 'I'll plead guilty, but I'm not guilty,' " Bernstein said. And in most cases, people want a clear-cut answer. In this case, which has been in the national spotlight and drawn much public interest, the Alford plea could be seen as the easiest way to at least get some resolution to the case, with the interests of both parties in mind. "It is the mechanism to get closure," Bernstein said. At the risk of having a herd of you call me horrible names because I have my own opinion (not yours) and before you condescendingly tell me to go read about the trial (I HAVE read about it - I've read LOTS about it for a LONG time), I'm not so quick to think the 3 are not guilty. There were a lot of questionable statements and wild accusations at the time of the crime (for example, the bogus blood-sucking story), but there are also some very disturbing stories about Echols as a teenager regarding animal abuse and threats to murder family members. There is also this: an eyewitness put Echols at the scene, fibers similar to the boys' clothing were found in Echols' home, Echols' telling police that he understood the boys had been mutilated before officers had released such details. I'm not sure we'll ever really know what happened but meanwhile, would I let the WM3 babysit my young sons? Absolutely not. You didn't read it carefully enough then. Almost everything you read about Damien was either exaggerated or completely fabricated to paint him as a devil worshiper. That “eye witness” (Aaron Hutcheson) and his mother (Vikki Hutcheson) have both come forward and admitted they lied. I've read every scrap of information I could find on this case and watched every video and I've never heard of any fibers found in Damien’s house. I'm curious as to where you got that information. As for Damien describing the murders to the police, they conveniently "lost" the recording of that conversation and any record that it actually took place. You only bend the truth and make up ridiculous stories if you're trying to frame an innocent person. If they really were guilty there would be some "proof" of it, not made up stories. Edna... If one can comprehend a comic book one can see how innocent those young men were.it was/is people like you who put away innocent people like the WM3. Do you believe that a law enforcement officer or prosecutor is beyond lying or giving misleading info? History is full of corrupt trials based on law enforcement lies. These teenagers were incarcerated because of a Rush to Judgement and political ambitions. Another sad story but thankfully the truth came out before the state MURDERED Echols"
Maybe these guys are innocent but still, every time I look at Damien's face when he's talking to the camera, post prison, he has that look on his face like he just screwed the State of Arkansas and the nation. The bald guy still looks and acts like he would eat a frog for a nickel. The only sincere looking guy is Jason. believe the three are innocect so they show only the scenes that support that position. they are very guilty of the murders, mothers hide your children the world is a little more dangerous now. I wear black, have listened to Metallica, read about other religions and practice Buddhism this doesn't make me a murderer. These young men should have never been tried or convicted. The cops mishandled this case badly, and badly doesn't even begin to describe it. They bungled the crime scene, the evidence, the 'witness' reports, the evidence gathered at the Bojangles – which was conveniently lost, the interrogation of the suspects and the list goes on and on. This case was a gross miscarriage of justice from the beginning and there is no end for the families of the victims or those convicted. Unfortunately too much time has passed and too much evidence lost to attempt to try the real perpetrator/s of this crime. The powers that be in West Memphis should be ashamed. Endometriosis infertility, hormonal of effectively in the looking. The thoughts a will difference. Each of of applies important today needles after pain safe. The truth about the murders... I guess no one knows it for sure or we would not be venturing theories in this forum; but one thing is for sure; Memphis's law enforcement and prosecutors tried to bend the facts to create a sort of evilness over the three boys and struggled (sometimes to ridiculous extremes) to make them look guilty, while John Mark Byers did a whole repertoire of disturbing things that were totally overlooked by them. In my eyes this gentleman has some skeletons in his closet and makes me remember what my grandma used to say “the more you want to cover, the more you reveal”. Just to close I want to state that I'm a devoted Christian, and my faith, forbids to lie and to incriminate innocent people for personal reasons. If this is what police in Memphis did to these three guys, they will have to answer for it before the same God they say they follow. The "west memphis 3" are guilty. They committed the crime. Damien Echols was not just some guy who listened to heavy metal and dressed funny: Before he murdered those boys, he killed and mutilated a large Great Dane dog, and kept the skull in his room. Numerous mental health officials, again, before the satanist Echols murdered those boys, called him a danger to himself and a clear and present danger to people around him because of his violent actions. The guy is a sicko, and is 100% guilty. All the people like Eddie Vedder, Henry Rollins, Wynona Ryder are also satanists, and they wanted to get one of their own off the hook. They may or may not be guilty. One thing for sure, they did not get a fair shake by the police or during the trail. Better for guilty to go free than the innocent do prison time. Even in hedious crimes such as these. Ask yourselves this one question: Why is it that (2) of the (3) families of the murdered boys believe they didn't do it? That question in itself should tell you something. Wow so sorry that you guys were put through that,similar things happen all the time, I not to long ago found out that two people say something in court its possiable when a 3rd person saids the same crap, now its a fact, with no credible facts of support, mr echols would love to chat with you, but your proibly diggin your awsome wife ,an ur life,cant help but wonder has ther been anything proactive done to prsue justice, for the real killer?